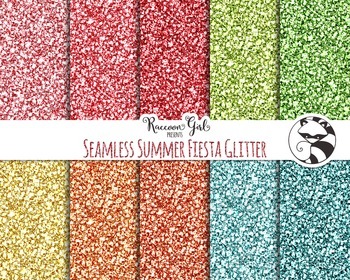 This beautiful glittery digital paper pack includes ten separate summer fiesta inspired colored papers. Bright pinks, summer sky blues, citrus orange, sunny yellow and zesty greens! Brighten up your summer inspired crafts or products with glitter! Perfect for your own summer themed designs and crafts. These colorful bokehs are completely seamless, so with the proper knowledge and software they can be repeated or tiled over and over again.